The durability of the human spirit comes into focus under the expanded eye of Ang Lee’s ambitious opus Life of Pi. Think the attempted magnificent reach of this year’s earlier tanker Cloud Atlas molded down into Cast Away. I won’t say Ang Lee, an auteur of his own making, entirely succeeds in his gargantuan spiritual quest, but his film is such a visual and magical triumph that I can’t discount it because of its under-compensating grasp. Like its Cloud Atlas brethren, Pi is based on a so-called un-filmable novel penned by Yann Martel. Perhaps he sorted out the details a tad better than screenwriter David Magee (Finding Neverland). The story involves a 13-year-old dreamer boy from India named Pi forced to leave his homeland with his family and the animals of the zoo they own. They board a vessel and voyage out to sea for the United States where the father has earned newfound employment. A late night’s early rumblings and flashes of lightning awaken Pi and he takes to the deck to experience the powerful storm’s beauty. Eventually the roaring waters overtake the ship and flood every level, drowning Pi’s family and most of the animals. Pi is loaded onto a lifeboat and finds himself caught on a mini-ark with a wounded zebra, a ferocious hyena, a wise primate, and a dangerous bangle tiger. The hyena soon attacks the zebra and monkey, leaving the tiger, named Richard Parker, to end the hyena’s life. Pi faces the entrapping vastness of the sea while simultaneously fending off Richard Parker until they both come to an understanding with each other. Pi takes to catching fish for himself and his new companion in order to keep each other alive until they can be rescued. The film is filled with outstretched symbolism to the point where Pi is forced to interpret most of the symbolism for later characters in the story. An adult version of Pi (Irrfan Khan) narrates the fantastical journey to a young reporter (Rafe Spall). “You will believe in God,” Pi tells him. The entire odyssey consists of Pi’s relationship to God throughout the catastrophic tests he faces. We learn young Pi becomes fascinated with religion early on as a child, first acquiring his parents’ Hindu roots before becoming enraptured in Catholicism where he grapples with the impossible love of God sacrificing his innocent son for the sins of the world. Later, Pi finds Islam literally in passing. His father instructs him that he cannot follow three religions at once and to either pick one to follow, or simply look to science to answer the majority of his questions about existence. Pi isn’t quick to lean into his father’s request, just as Pi isn’t quick to see the carnivorous tiger as a simple wild animal. “In his eyes, there is a soul.” Throughout his journey, Pi cannot explain why God has placed him under the weight of such loss and misery. But Pi never loses hope and never accepts that God has abandoned him. He also may not be able to narrow down the ‘correct’ version of God, but he never loses faith that God loves him and is consistently carrying him through every obstacle. 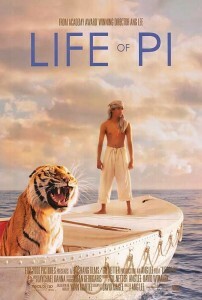 Life of Pi is Ang Lee’s quest of faith for the audience. The film reaches a wobbly conclusion that lessens a bit of the fantastical impact of the themes blooming to life, but the film is so majestic and ambitious that I couldn’t help but be captured by the spirit of it. While many may view this as an opportunity to shoehorn the incarnation of God into a catch-all for every religion and belief system, I viewed it more as a thoughtful exploration of sorting out the attributes of God rather than the versions. The film also works largely due to the lavish spectacle it is wrapped in. The production values are top-notch. You will not see better special effects all year. This is the first time that I can truly say the CGI effects used to create living creatures had me 100 percent convinced I was watching real animals. 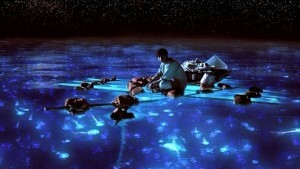 Lee also utilized impressive 3D technology to enhance the experience in the same way Avatar used it. The images have a crisp and life-like depth. I can’t recommend the film’s visual aesthetic enough. 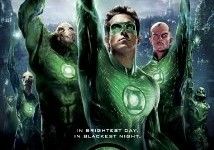 If you choose to take a leap of faith on this film, see it on the big screen in 3D. Life of Pi is certainly not a perfect film, but I think it examines a dedication of faith along with all of faith’s questions and doubts—and does it well for a major studio production. In a world trying desperately to erase any and all versions of a Creator-based faith by replacing it with a faith in unprecedented and foolish chance of existence, Life of Pi, despite its shortcomings, is somewhat of a miracle. The pacing and conclusion may test some viewers’ patience, but I think those willing to invest in the story will still find the film plenty worth their while. A quick note to parents: the film pushes the limits of its PG rating with some very intense moments of animals attacking other animals. None of the shots are particularly ‘graphic’ or bloody, but there are scary instances for young kids.